One of our aims at Regents International School Pattaya is to engage with our local community as much as possible and to learn through them and with them. Thailand is our host country and it is only right that we celebrate the unique culture and customs of the people who live and work with us. Below, Paul Crouch, Assistant Principal at Regents, mentions just some of the ways our students and staff connect with the community. With this in mind we believe it is vital as a Round Square school on the outskirts of Pattaya to burst the ‘bubble’ that many international schools can find themselves trapped in and seek not only cultural but also social diversity. Our Community Partner Programme has been implemented across the school for over 10 years now and we are fortunate to have over 50 different partnerships with local schools, NGO’s and individuals that do amazing things in our area. Located on Sukhumvit Road, the Father Ray Foundation is welcoming and friendly. There is plenty to see and do at the Foundation, including visiting the Day Care Centre, the Vocational School for the Disabled, the Redemptorist Centre (you can stay the night! ), the North Star Library, the café and possibly the most elaborately decorated church in Pattaya – see if you can spot the plates! If you have any electrical items that need fixing, like a TV or a fan, then the amazing students at the Vocational School have a workshop where you can take your appliances to be fixed by feet only! The Father Ray Foundation is also a great place to spend the festival of Loy Krathong, joining the community around their small lake to float your krathongs with the residents. One of the longest established foundations for educating street children in Pattaya, the Fountain of Life is run by the Good Shepherd Sisters and financially supported by the charity Jester’s Care for Kids. Located just off Third Road and near to North Road, the centre is open every day of the week and welcomes visitors to come and learn and play with the children. They especially love to sing songs and engage in art and craft activities. Kru Wannee is the Head teacher and can tell you all you need to know about the centre and the children. Make sure you also find Sister Joan and have a good old Irish chat with her. Founded by Khun Tiew, an icon of community spirit and support work in the Pattaya and Rayong area, Our Home is a project that looks after women and gives them the skills to make a living for themselves through embroidery and cooking. The Home is located on the Green Valley road to Ban Chang and you can call in any time to order some amazing needlework, tasty baking or fresh fruit and vegetables. Look out for the Our Home ladies selling their cakes and pies outside Regents’ main gates every day after school. If you have a free hour any morning during the week grab your nail polish kit, spare hair ties and bands, your favourite CD of pop songs and head down to the Ladies Home just off Sukhumvit Road in Banglamung. The ladies just love getting their nails painted and their hair made up and if you have time they would love to sing karaoke and have a dance with you. I doubt you will see bigger smiles anywhere else in Pattaya! A good 45 minutes’ drive north of Pattaya towards Bangkok and opposite Khao Kheow Zoo you will find the Bang Phra Wildlife Conservation Centre. Supported by one of the school’s long standing community partners, Love Wildlife Thailand, the centre takes in animals that have been illegally traded or mistreated across the country. When I was last at the centre with students, five suitcases arrived from the airport that had over 400 turtles in them and had been abandoned on the luggage carousel. Regents has also sponsored and helped construct an education facility at the centre and groups are always welcome to visit and volunteer there. Founded by the inspiring Khun Mechai himself, the Mechai Patana School in Jomtien is part of the Bamboo School located in Buriram Province. This is no normal Thai school as it embraces experiential learning, entrepreneurship and sustainable development in everything that it does. Learn how to make over 350,000 Thai Baht on one rai of land by planting fruit and vegetables. The students also form the largest ukulele band in Thailand and are always happy to play a few songs for their visitors. The school is right next to the Cabbages and Condoms restaurant and both must be visited when in Pattaya. Search for the Thai Tims on Youtube and you will be spoilt for choice for famous Celtic songs sung by the most enthusiastic Thai children. ‘You Just Can’t Get Enough’ is a favourite of ours at Regents and if you get the chance to visit the Good Child Foundation in Chantaburi you must ask the Thai Tims to sing this one for you. 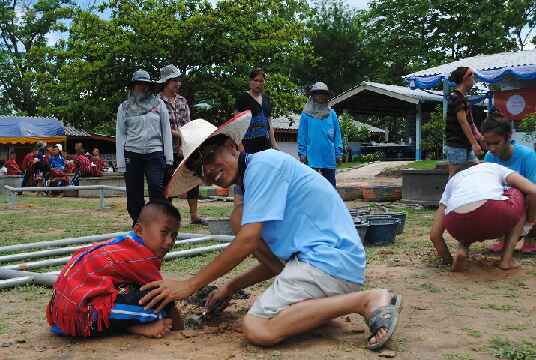 The Foundation is the only Thai school in Thailand to take in down-syndrome children and give them a normal education. Paul and Khun Pun, the creators of the Thai Tims, have dedicated their lives to supporting these amazing young children and teaching English to all the other kids at the school. This is the place to visit if you are a Celtic supporter – you will be blown away! The Tamar Centre is on Third Road just before it meets Pattaya South Road. It has a café on the ground floor and sells the best cinnamon swirls you will find in Thailand. The centre supports women who want to learn new skills and helps them find reputable work and employment. You can also buy some amazing craft products from the Tamar Centre including original handmade jewellery for those special occasions. Kate’s Project is a small but big-hearted community partner that makes a real difference to the poorest of people living in the slum areas of Pattaya that we often forget about as we go about our daily routines. Joining Khun Noi on one of her daily trips to visit the people that have literally nothing is an eye-opener for anyone. If you have any second-hand clothes, toys, blankets, toiletries, packaged food or free time – then spend the morning with Kate’s Project and learn what life is really about when living in the slums. This small but impactful foundation is located behind Big C in South Pattaya and is passionately coordinated by Margie and Khun Pai. TheHand to Hand is a day care centre for young Thai children and they have loads of fun learning and playing together every day in the busy and colourful classroom. The staff are always welcoming and the children love visitors, especially if you turn up with balloons, bubbles or snacks! Located on Sukhumvit Road and passionately led by Khun Toy, who welcomes visitors at all times to the centre, the Orphanage is a must visit to play with the little babies in the playroom or to kick a football around outside with the bigger kids. Regents does a half-termly clothes, toys and food collection and drop through our boarding community and our students always look forward to a game of football when they visit. You must also pop into the Deaf School at the same location and learn how to sign language from the children who live and study there. If you want to meet amazing teachers who are dedicated to their work and inspire young people on a daily basis then the staff at the Deaf School are about the best that I have had the privilege to meet and work with – go see for yourself!